HESS & Associates Engineering, Inc. takes great pride in every project. Listed below are samples of completed projects. 3,500 L.F. Sanitary Sewers, 700 L.F. Storm Sewers, and 1,700 L.F. of Waterline. Complete planning for new 100,000 gpd treatment plant and sanitary sewer (19,000 l.f.) collection system. EPA Loan Fund Planning Loan Procurement and coordination. Village of Burton - Annual Street Improvement Projects. Bid document preparation, bid and construction services. 2000 - West Parking Lot Resurfacing. 1999 - Ford Lane Resurfacing. 1998 - Garden & Spring Street Resurfacing. 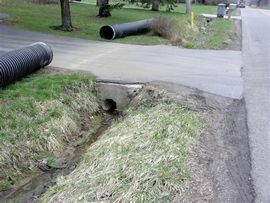 Village of Burton - Sanitary Sewer System I&I Study and Removal. Bid and supervise the televising of 26,000 l.f. of sanitary sewer. Bid and supervise the repairs to the sanitary sewer system. USDA Funding Procurement and coordination. 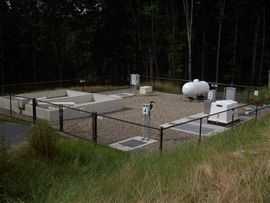 Telemetry System and Motor Control Center Replacement for Water Treatment Plant. Lander Road Water Line Extension - Pepper Pike, Ohio. Design and permitting for a 750 lf. water line extension. Water system improvements including new storage tank, filtration and high service pumping. 2,300 L.F. Roadway, Detention Analysis, Culvert Design, Erosion Control Practice. 1,100 L.F. Roadway, Detention Analysis, Culvert Design, Erosion Control Practice. 10,000 GPD Wastewater Treatment Plant Design. Troy Elementary - Berkshire School District. Upgrades including new aerated equalization, dosing station, surface sand filters and chlorine contact tank for a 3,500 gpd extended aeration treatment plant. Gardiner Elementary - Kenston School District. Replacement of existing steel aeration treatment plant with a new 10,000 gpd treatment facility including trash trap, equalization, extended aeration, clarification, dosing, surface sand filters and chlorination. Upgrades to an existing treatment facility including equalization, sludge holding, dosing and surface sand filters. Montessori Farm School - Huntsburg Township. Design of a new 1,500 gpd extended aeration treatment system including; trash trap, equalization, aeration, clarification, dosing, surface sand filters, disinfection, wetlands polishing, and 20,000 s.f. evaporative pond. Tim Frank Septic Tank Cleaning Company - Huntsburg Township. Design of 20,000 gpd septage receiving facility including; four settling lagoons totaling 650,000 gallons, four treatment wetlands @ 17,500 s.f. each, 1.8 million gallon holding pond and 24.8 acres of spray irrigation area. Preparation of a sludge management plan to land apply biosolids generated by the septage receiving facility. Squire Valley View Farm, Case Western Reserve University - Hunting Valley, Ohio. Design of two on site dissipation septic systems for the buildings on the site. Weigand's Lake Park - Russell Township. Design of a new on site dissipation septic system for a picnic facility. Design of extended Aeration Treatment System and a Drip Disposal System. Design of extended Aeration Treatment System and Drip Disposal System. Preparation of a site plan for a new school facility, evaporative pond, and completion of pre/post storm water analysis for the site. Custom Landscaping - Newbury Township. Preparation of a site plan, design of on-site dissipation septic system and completion of storm water management plan and detention analysis for detention pond. Edge Learning - Akron, Ohio. Preparation of site and utility plans for the construction of a charter school building. Hess Wetlands - Newbury Township. Design and permitting for the restoration of a 40 acre wetland and reconstruction of a 300 ft. long x 10 ft. high earthen dam. Middlefield Mobile Home Park - Middlefield Township. Planning and design of an expansion to a mobile home park including; roadway design, water system expansion and sewer system expansion and storm water management plan. Preparation for Driveway and Building Improvements. Mercury Plastics - Site Plan and Improvement for a building addition.